When dogs get together, they will sort themselves into ranking order and as humans, you hardly have any say in the matter. 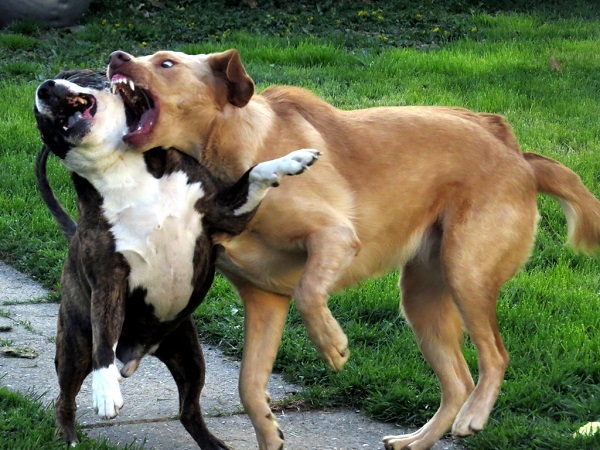 Most dog fights are serious situations- not only for your dog but for all involved. If your dog gets into a serious dogfight with another at a park, you must break it up before it gets ugly. Let us take a look at some ways to break up a dog fight. 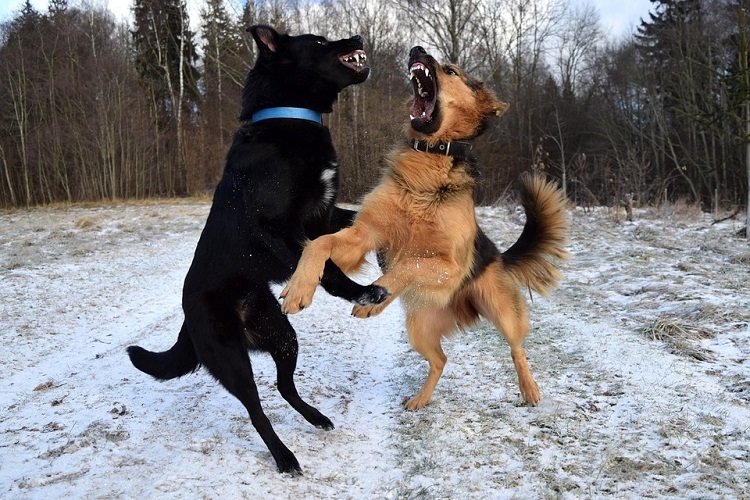 A dog fight usually starts with lots of teeth baring and snarling. In order to prevent the dog fight from getting very serious, this is the stage to intervene at. Most dogs will not attack humans as they are usually intent on the other dog/s. But if there are teeth involved, you must protect yourself from bites. As soon as you see the dogs snapping, snarling and running towards each other, you have a few moments to intervene and take the dog away. This is the first thing to do in order to stop a dog fight before it starts. If you are not alone and have another adult with you, each of you needs to get behind each dog and pull it away. Do this slowly, do not yank the animals. Pull them apart until they let go of each other’s body parts. You may even grip the base of the dog’s tail and pull it away. The other person can do the same with the other dog. Try to lift the dog’s rear quarters off the ground. Use this technique as a last resort. Pulling the dogs by their collar will help you get the dog away from the fight but their bite can accidentally be redirected towards you. If you are not wearing gloves, this is the worst thing to do since gloves could, to some extent, protect you from re-directed bites. As soon as you can, secure each dog with a leash and keep them away from each other. Work the dogs backwards and loop the leash around the dog’s head. You need not try clipping the leash to the collar- just get the dog settled first. You can secure the dog to a fence post or a tree; whatever is available. High pressure water hose is the easiest way to break up or even stop a dog fight before it starts. Blast the fighters with high pressure water hose provided one is available nearby. Many essential oil sprays can come in handy when breaking a dog fight. Pepper spray for dog fight also works or you can use oils like pressurized Citronella spray. Spray it at the dog’s face which will be extremely irritating and painful to the animals. The harsh smell is also repulsive to them. If you are alone when the dog fight occurs, then pepper spray dog fight breaking is the easiest solution. You can also keep an aversive like Lemon juice to spray on the dogs. A fire extinguisher also makes for an effective tool to break off dog fight. Hose the dogs down and break up the fight easily. Yell loudly-depending on the intensity of the fight, this method could work. Try dropping several metal pans on the ground. You can also use ultrasonic shrill whistles. A lit match under smoke detector can be used in extreme cases. In case you are always faced with situations of dog fights buy a marine horn-these are really loud and can break the most serious fight! This is an effective strategy to stop dog fights in serious fighting breeds like pitbull. Attach two handles to a sheet of plywood. When a fight occurs; place the board between the two dogs. Be careful though-parting sticks like these can break teeth and could even turn the attacking dog on the person who tries to break the fight. The way to break up a very serious dog fight when the attacker has latched on and won’t let go is using a blanket. To break up a dog fight with blanket, wrap the blanket over the attacker’s eyes and mouth. As soon as it lets go of the other dog, pull it back. If the attacking dog is attempting to seriously injure or kill its victim, twist the blanket or dog collar to cut off air supply. Make sure you inspect each of the dogs after a dog fight. If all is fine and no ambulance is required, take a moment to breathe and relax. You will also need to train your dogs to behave and avoid such incidents again. Try these 11 easy and effective strategies to break up a dog fight by yourself.